“Give us a kiss,” said the man serving me coffee. He wasn’t talking to me, but it was just as—if not more—inappropriate. Rather, he was talking to my daughter Violet. It’s not the first time. In the last two months, two other relative strangers—a neighbor and an old family friend at a wedding—have bent down to my 4-year-old’s level, tapped their cheek in expectation, and demanded a kiss from her. On each occasion I’ve wanted to scream, “Don’t ask my daughter to kiss you, it’s creepy!” I remember being presented with cheeks when I was a kid and feeling the discomfort of such forced intimacy. But despite my own bad experiences from childhood, I didn’t intervene on Violet’s behalf. I stood there silently and watched as she hesitated, flinched, and then obliged. I’m quite sure that all three of the kiss demanders—one woman and two men—were good people. They weren’t being predatory, and I didn’t want to offend them or cause a scene. I was being the people-pleasing good girl that I’m trying—obviously not very successfully—to teach Violet not to be. I prioritized social harmony and appeasing relative strangers over the wishes of my daughter. But I won’t do it again. The reason is that a kiss isn’t just a kiss, no matter how innocent and innocuous the intent might be. The ritual of demanding affection from children on cue is one of those tiny, everyday little lessons in which we teach children—especially girls—that they are to tailor their emotional responses to please others. This is despite the fact that we go to great lengths to tell children that they are in charge of their bodies. But if their bodies are truly their own, then they also need to learn that they’re in charge of their instincts and desires. If a child doesn’t want to kiss a relative stranger—and let’s face it, why would they?—then they shouldn’t have to. I want Violet to know that her intimacy and affection is always under her control and she should never feel obliged to give it away for somebody else’s benefit if she doesn’t want to. She shouldn’t have to provide affection on cue just because social rituals demand it. By remaining silent and acquiescing to strangers’ desires for Violet’s affection, I effectively told my daughter that “It’s OK to say no”—except when it isn’t. This message is too subtle for a 4-year-old to grasp. It can only be understood in absolutes. Which means that Violet needs to know that if she doesn’t want to kiss somebody then she shouldn’t. She also needs to understand that I will always back her unequivocally, no matter how embarrassing this will be to me, or the person asking for a kiss. 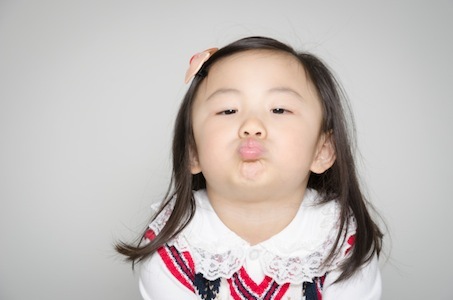 A couple of friends who also find it creepy when people demand kisses from their kids, navigate the social awkwardness by suggesting that their child gives the kiss-requester a high-five or a handshake instead. These options give children more choices about how they respond to friendly advances. Children are introduced into the world of civil graces, recognizing and acknowledging others, while also putting in place boundaries. That’s fine for genuinely friendly approaches, but we still need to make clear to our children that if they ever feel uncomfortable, and feel that they’re being pressured to oblige, then they have the right to say no—even if it causes offense. Personal boundaries are taught—and should be taught—early and consistently. The next time someone asks for a kiss from my daughter, I’m going to use it as a teachable moment. It’s an opportunity to reinforce the message—both in practice as well as in theory—that the only person who decides who she kisses is her. When Will Real Families Get The Help They Deserve?